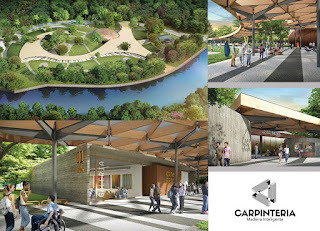 Carpinteria Timber Structures is a Brazilian timber engineering company that works with calculation, fabrication, and assembling of timber structures such as Glulam and CLT. They are now working on a 4,000 sqm parametric canopy for Rio de Janeiro made of timber and steel. They are using Rhino, Grasshopper, and Karamba to draw and do the calculations of the timber structures. These help them create a parametric grid on the complex surface and transform it into Glulam Beams. They will also be using Rhino to make the shop drawings of the timber beams to send them to their 5-Axis CNC machine; this way they will be able to cut all the pieces in the right angle, making the work faster on site. For additional information please contact Alan Dias.